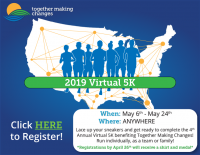 Together Making Changes 4th Annual Virtual 5K! You pick the place (your treadmill, local track, hiking trail, etc.)! A Virtual 5K gives you the flexibility to complete the distance on your own time at your own chosen location. No matter where you are, you can get active while also giving back to Together Making Changes. Register here!